ESA's Planck mission has revealed that our Galaxy contains previously undiscovered islands of cold gas and a mysterious haze of microwaves. 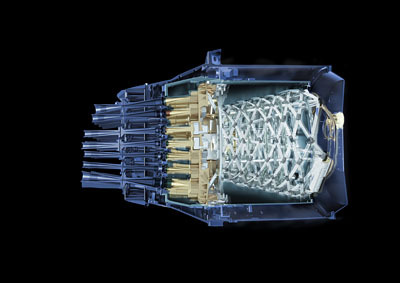 These results give scientists new treasure to mine and take them closer to revealing the blueprint of cosmic structure. 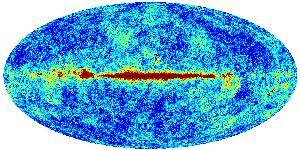 The High Frequency Instrument on ESA's Planck mission has completed its survey of the remnant light from the Big Bang. The sensor ran out of coolant on Saturday as expected, ending its ability to detect this faint energy. Planck worked perfectly for 30 months, about twice the span originally required, and completed five full-sky surveys with both instruments. 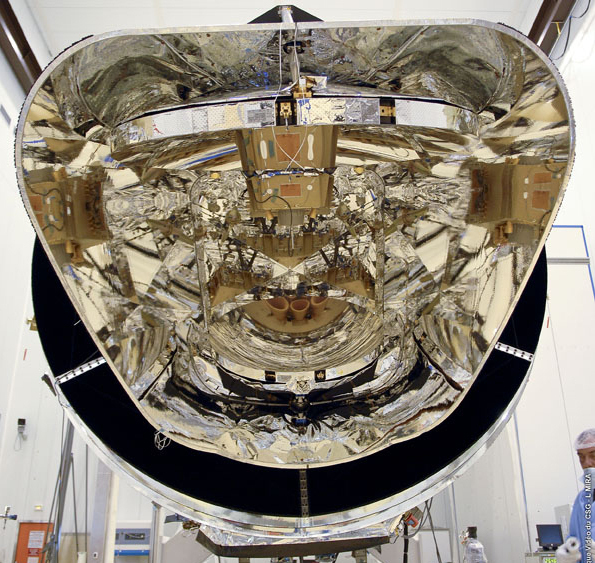 Able to work at slightly higher temperatures than HFI, the LFI will continue surveying the sky for a large part of 2012, providing calibration data to improve the quality of the final results. The Planck conference in Paris this week will be dedicated to the impressive results achieved in the first year with the ”Planck Surveyor“ satellite mission to study the Big Bang, 14 billion years ago: a catalogue with 15000 celestial objects such as galaxy clusters, quasars, radio galaxies, nearby galaxies and galactic dust clouds, 25 scientific papers, as well as the most precise measurement of the far infrared background, which reveals star formation in the early universe. 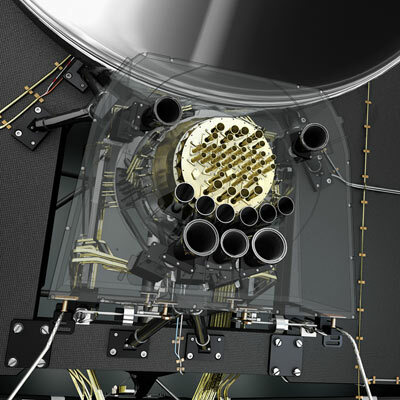 The Max Planck Institute for Astrophysics developed important software components for Planck and is heavily involved in the scientific interpretation of the mission data. 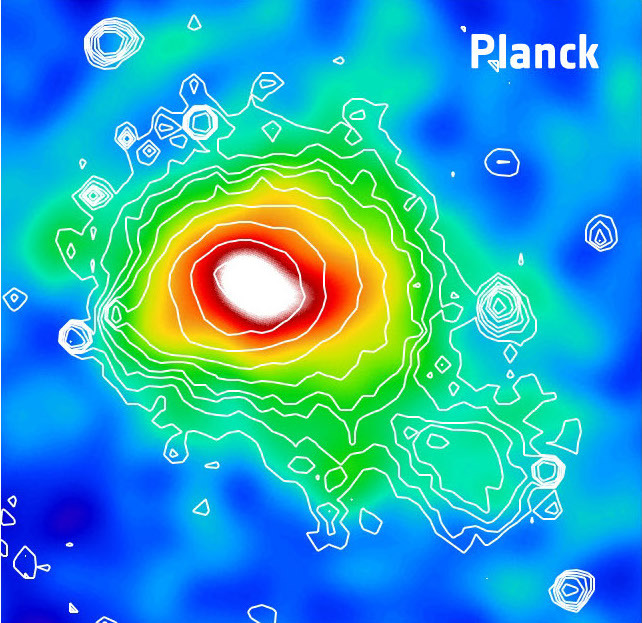 Surveying the microwave sky, Planck has obtained its very first images of galaxy clusters, amongst the largest objects in the Universe, by means of the Sunyaev-Zel'dovich effect, a characteristic signature they imprint on the Cosmic Microwave Background. Joining forces in a fruitful collaboration between ESA missions, XMM-Newton followed up Planck's detections and revealed that one of them is a previously unknown supercluster of galaxies. 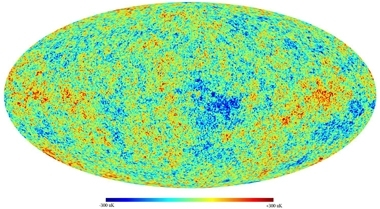 Less than a year after routine operations began for the ESA Planck satellite, the international consortium now released the first all-sky image of the microwave sky, using data spanning the full frequency range of Planck from 30 to 857 GHz. 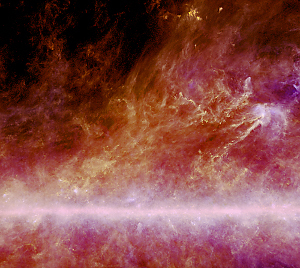 Giant filaments of cold dust stretching through our Galaxy are revealed in a new image from ESA's Planck satellite, for which software for data processing has been developed at MPA. Analysing these structures could help to determine the forces that shape our Galaxy and trigger star formation. 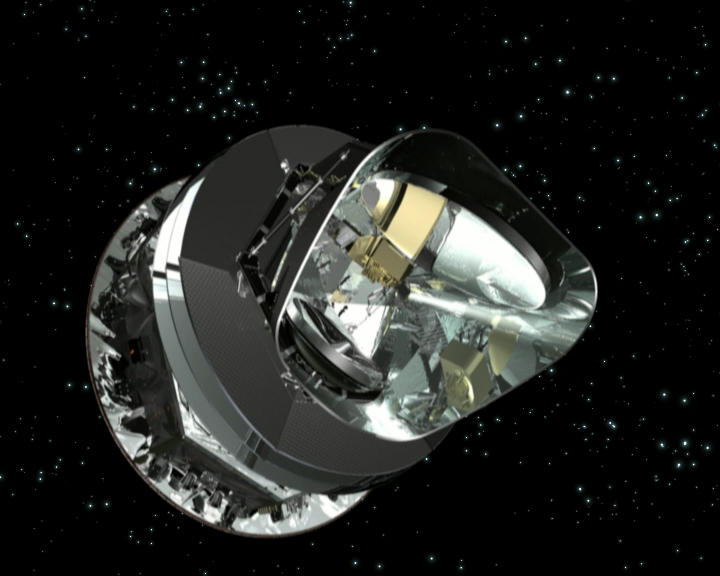 Planck, ESA's mission to study the early Universe, started surveying the sky regularly from its vantage point at the second Lagrange point of the Sun-Earth system, L2, on 13 August. The instruments were fine-tuned for optimum performance in the period preceding this date. In preparation for routine scientific operations, their long-term stability was verified by conducting a first trial survey. 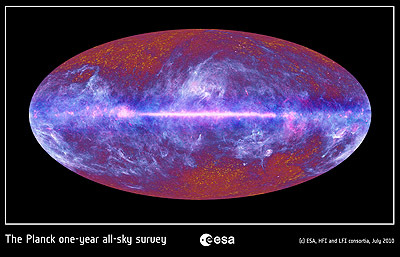 This survey was completed on 27 August, yielding maps of a strip of the sky, one for each of Planck's nine frequencies. 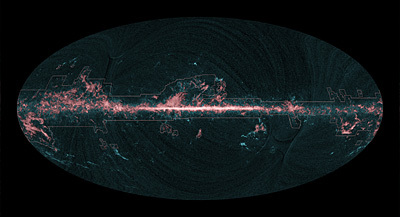 Each map is a ring, about 15° wide, stretching across the full sky. Preliminary analysis indicates that the quality of the data is excellent. One week into the First Light Survey, operations are progressing as planned. The satellite, payload and the ground segment infrastucture are all stable. There is therefore good confidence that the routine phase of the mission will start during the pass of 27 August. As of 13th August 2009, Planck is in "routine operations mode". The first two weeks are taken up by the "First Light Survey" which is intended to check that everything really is working in that mode. Providing everything works as expected, Planck will continue to operate in this mode. A comic about the cosmos. MPA at Garching offers a teaching tool using an unusual method, a picture story in internet to attract interested amateurs. 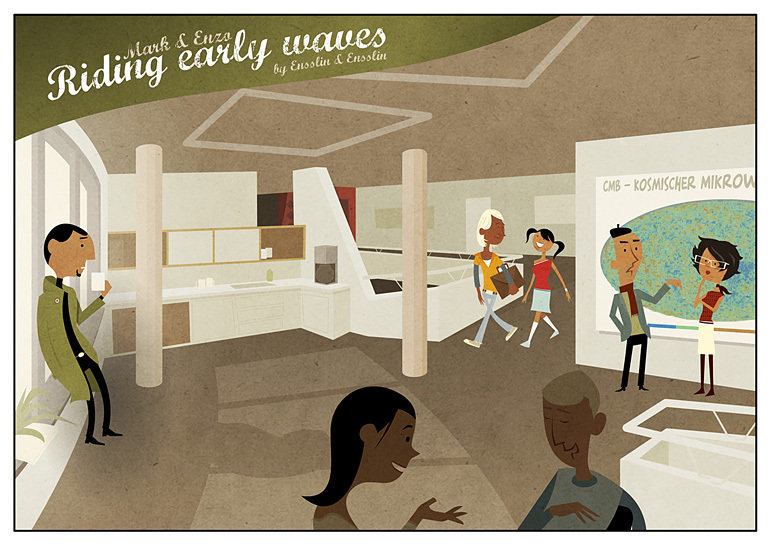 The comic explains the physical processes that took place during the first 400.000 years after the big bang. The In-Orbit Commissioning Review finalised successfully on 21 July. We are now officially in Calibration and Performance Verification (CPV) Phase ! The activities planned in the CPV plan in fact started already in June, interleaved with commissioning activities. So far everything is behaving nominally, and the CPV activities are being carried out largely according to plan, which explains why there has been little to report in this page. A few anomalies in the first two weeks of July - all now under control - have induced some slip in the schedule. It is now expected to start the First Light Survey around the 8th of August. The First Light Survey is a two-week period which makes the transition from CPV Phase into Routine Phase. So routine surveying of the sky should start in the last week of August. 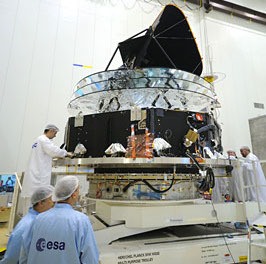 Beginning today, ESA's Planck satellite will carry out a critical mid-course manoeuvre that will place the satellite on its final trajectory for arrival at L2, the second Lagrange point of the Sun-Earth system, early in July. The manoeuvre is scheduled to begin at 19:28 CEST on 5 June 2009, and will last for up to 30 hours. The last tests of the Ariane 5 rocket system have been finished, and ESA's Planck satellite is sitting ready for launch at the Guiana Space Centre in Kourou. 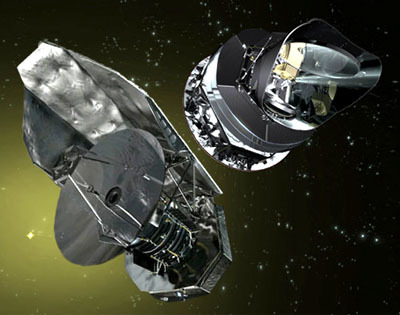 Together with ESA's Space Telescope Herschel, Planck will start into space on 14 May to begin its studies of the cosmic microwave radiation and of the clues it gives about the Big Bang, the earliest phases of the cosmic history, and the structure and composition of the Universe. 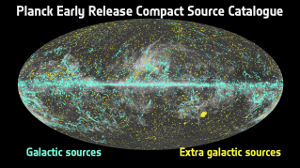 The Max Planck Institute for Astrophysics (MPA) in Garching has developed important software components for Planck and is getting ready to participate in the analysis and scientific interpretation of the mission data. 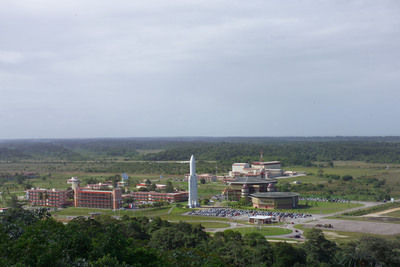 Tests conducted on Planck at Europe's Spaceport in Kourou, French Guiana, have confirmed that the satellite's subsystems work perfectly, and the helium dilution cooler tanks have now been filled. While the final clean-up continues, the solar array has been checked, the satellite has been integrated with its launcher adapter and fuelling is complete. Due to an anomaly discovered during tests on a subassembly identical to one on the Ariane 5 launcher, Arianespace has decided to carry out additional checks, which will take several days. 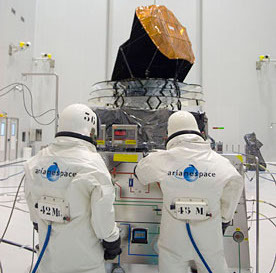 The two satellites are in perfect condition at the launch site in Kourou, French Guiana. 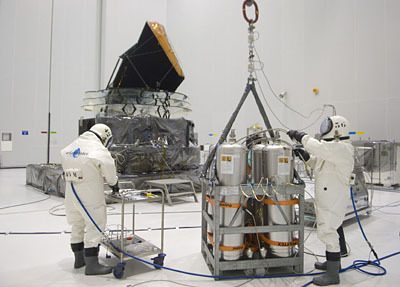 Fuelling operations for the Planck spacecraft have been successfully completed last week. The filling of the propellant tanks with hydrazine liquid was performed in the S5A building at the Centre Spatial Guyanais launch site on 15 and 16 April. Over the past few weeks, the upper part of Planck's outer solar array has been covered with multi-layer insulation, the satellite has been prepared for upcoming helium filling operations, several sub-system functional tests have been carried out and it has undergone final cleaning before launch. The launch of two European astronomical observatories Planck and Herschel will slip until May because engineers need extra time to make sure the Herschel telescope can survive the extreme mechanical pressures of blastoff. 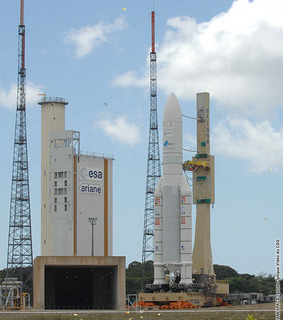 In order to carry out additional checks on the ground segment of the Herschel and Planck programmes, Arianespace and ESA have jointly agreed to postpone the launch initially planned for 16 April. A new launch date will be announced end of March. "Arianespace has taken delivery of its second Ariane 5 ECA for launch in 2009, receiving the heavy-lift vehicle for installation of two spacecraft that will study the universes origins." 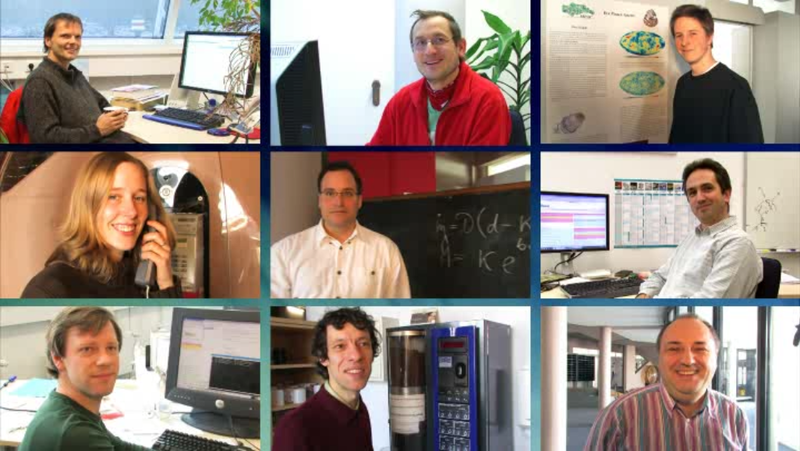 A 6-minute vodcast introduces Planck, the contribution of the MPA to this mission and the Planck team at the institute. The viewer learns about the main objectives of Planck and the scientific and personal visions of MPA scientists involved in the project. He gets an impression of the 10-year work of the software developers at MPA, which had to be put into this project in order to make Planck ready for launch. 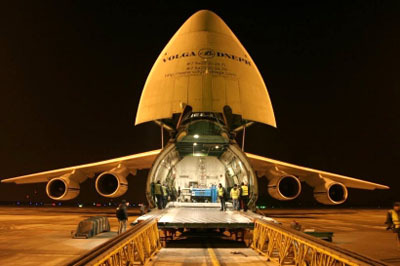 Planck, ESA's microwave observatory that will study the relic radiation of the Big Bang, was shipped from Liege, Belgium, to Europe's Spaceport in Kourou, French Guiana, on 18 February. 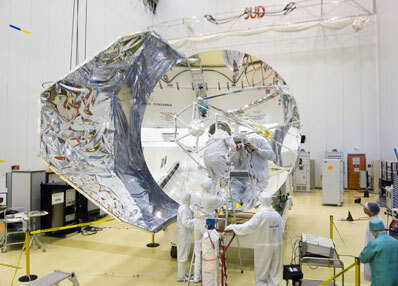 The spacecraft is scheduled to be launched in tandem with ESA's Herschel infrared observatory on 16 April. ESA's Planck mission that will study the relic radiation from the Big Bang has successfully completed its test campaign in Europe. 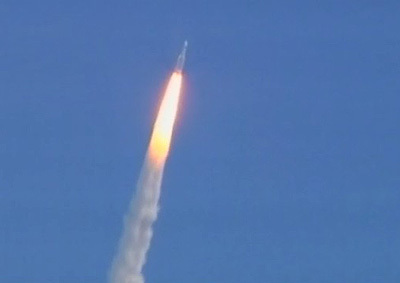 The spacecraft will soon be shipped to Europe's spaceport in Kourou, French Guiana. Planck is Europe's first mission to study the relic radiation from the Big Bang. 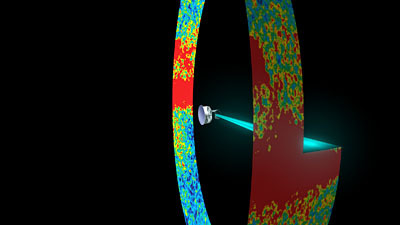 Ever since the detection of small fluctuations in the temperature of this radiation, called Cosmic Microwave Background, astronomers have used the fluctuations to understand both the origin of the Universe and the formation of galaxies.